It is considered that the color of the lunar disk, you can determine the weather for the coming days and even predict some events. 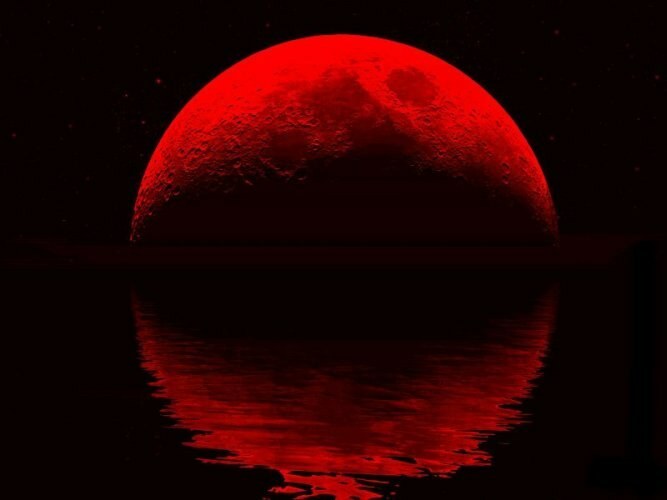 In ancient times people with fear watched the red appearance of the moon, believing that it is a harbinger of strife or war. Modern researchers have found a scientific explanation for the red color of the moon. How to find out what the moon is growing or waning? The moon can have a variety of shades – from yellow, to orange and blood red. Most often the unusual color of the lunar disk due to the lower atmospheric layers. Small dust particles in near-earth layer have the property most likely to absorb the red part of the spectrum and well disperse the color red. For this reason, all objects in the field appear to acquiring a reddish and sometimes full of bloody hue. The greatest dusty lower atmosphere is observed in dry and windy weather. Sometimes the redness of the moon becomes more distinct due to volcanic eruptions, during which the removal of the ashes to a considerable height. For example, in mid-June 2011 in Africa and Asia, the Moon seemed blood red, when the eruption of one of the Chilean volcanoes, accompanied by ash emissions. This event coincided with a deep lunar Eclipse, where the moon and already acquires a copper colour. At that time in the airspace was so much ash that the Moon seemed to be bright red or orange. Particularly well this phenomenon is observed in Asia. The redness of the moon actually led to some unpleasant events because of the abundance of ashes was canceled many of the flights that evacuated thousands of residents in areas adjacent to the volcano. Of course, today, anyone and would never associate these events solely with the color of the lunar surface. A lunar Eclipse, as already mentioned, is also able to change the face of the moon. During the onset of partial or total lunar Eclipse the Moon disappears from view and becomes a dark shade of red. Why is this happening? Even in the phase of full Eclipse the moon is illuminated by the solar rays which are tangent to the earth's surface. The Earth's atmosphere is transparent to rays of orange and red end of the spectrum, which explains the copper color of the moon during the Eclipse. Dust particles only increase this effect.